On the outskirts of most towns and cities live the Roma. Roma are not Hungarian or Ukrainian, but rather originally natives of India who immigrated in the middle ages to Europe. Living in impoverished camps and mud brick homes, the vast majority of Roma have never or rarely been to school and are illiterate. 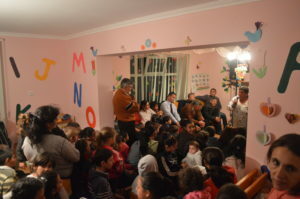 The local church has begun a number of kindergartens and afternoon school learning centers for Roma children in an attempt to bring the gospel to these people, as well as to educate them by teaching them to read and write. Typical kindergarten activities and games are also conducted and it is also an opportunity for the children to eat a hot lunch. 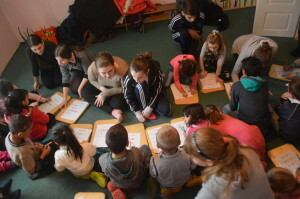 We partner with one of these kindergartens every Tuesday afternoon through winter and spring months by bringing high school students from the Peterfalva Reformed High School to organize an afternoon program of a Bible story and lesson, singing and prayer, crafts, writing exercises, and games. We believe that this a great opportunity for students from the high school to show the love of Christ to a less fortunate people of their own communities. We hope and pray that it will also aid in removing the racial barrier that divides and separates the Roma from their Ukrainian and Hungarian neighbors. It is a valuable opportunity for the young Roma children to learn about God and the Bible as well as to practice and learn necessary life skills such as reading and writing and table manners. Our second major program involving Roma this past year was an after school program in the city of Beregszasz. Local university students partnered with us in this endeavor. The university students go on a weekly basis to conduct an after school program centered around beginner English lessons and a devotion. The after school program was well attended and we were proud of the diligence and effort the university students gave on behalf of children who attended showing them the love of Christ. Involvement in the Roma community came in different ways this past year. A local pastor by the name of Elemer helps to run the local Roma kindergarten. He regularly drives up and down the streets of the village picking up children in the camp and taking them to the kindergarten. Many of these children probably would not attend if it was not for the ride he offered to take them. Driving from one camp to another he must also pass by the local state school. Allowing him to take older children to school as he passes by to collect younger children for the kindergarten. Many of the older children like their younger siblings would not attend if not for someone making an effort to go and get them. Pastor Elemer’s van broke down for a couple of week stretch this past spring. He asked me to cover for him with our old yellow Volkswagen van. It was an interesting and eye opening experience for me to see his involvement in the Roma community and to transport van loads of children back and forth to school and kindergarten. One late spring night Elemer organized a special outreach evening with a guest speaker in the Roma congregation. Over one hundred people came and packed the small building. Lasting long into the night, upon nights end I was asked to transport mothers, infant babies and small children back to the camp to save them a two mile walk in the dark. Once again I felt blessed that God has opened these small windows into the life of the Roma. Working among the Roma, more commonly known around the world by the misnomer, Gyspy, brings both joys and frustrations. Often times we find ourselves frustrated with feelings that are far from Christ-like; judgmental and exasperated, annoyed or even angry. Many times, in a week, sometimes several times a day, Roma come to our door asking for money or food. Some have let themselves into our house uninvited. Then there is also theft. This past February, a bag of chicken that I had placed outside to thaw was taken from our front porch. Apart from feeling frustration towards these people who ask with such a demeanor that can be perceived as entitlement, there is also in us a sense of helplessness at the overwhelming neediness that these people possess. We are often left feeling lost as to the best way to help them. It raises many questions: How can we help the Roma without hurting them? How can we minister to their seemingly insurmountable needs, both physical and spiritual? Is true change possible for them? Sometimes in frustration I even wonder, is this possible? How can you help someone change their habits and their life when it seems the entirety of society and culture is against them? Sometimes Roma come and beg for handouts while seeming totally unwilling to take personal responsibility to alter their predicament. Can the Roma rise above their current poverty when it often appears that history, prejudices, racism, and stereotypes are stacked against them? Some Roma do. Why don’t the majority? Incidences such as begging and theft can leave a disagreeable taste in one’s mouth, and cause a sort of ungraciousness, bitterness, and an attitude of indifference to well up in us. We need reminding that the Roma are image bearers of their Creator, just as we are, and no less so. Their most basic need is also ours. They stand in need of Christ and His redemptive work on the cross on their behalf, just as we do. No amount of money, aid, or welfare is going to change their situation. Only Christ can change the Roma, as only Christ can change us. Both a humbling and infinitely hopeful thought! Only Christ can change the lives of the Roma giving them hope, not only for today, but for eternity as well, yet how will this happen if they don’t know and believe in Jesus? I am reminded of Paul’s words in Romans 10:14-15. The local church in the last decade has begun many ministries towards the Roma. Some have succeeded, others have not. Many in the local community have a heart for the Roma, while many others look upon the Roma with scorn. The success of these ministries often seems to wax and wane. 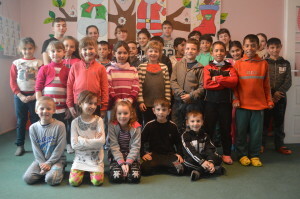 One such ministry near us is a local Reformed Roma kindergarten and Christian after school center. Young children come in the morning for kindergarten, and older students come after school for help with reading and school work. Most Roma are illiterate and most do not go to school. Those who do go to school, go inconsistently. Percentage wise there is a very small amount of Roma children out of the total population who are coming for the kindergarten and after school program. It has been a blessing to us to be able to go to partner with this local outreach in a few different ways. Once a week we go with students from the local Peterfalva Reformed high school to lead a Bible lesson and prayer, singing and a Bible memory verse, activities and crafts. Our team includes Eric and myself, as well as 7-10 high school students. Interest was high among the students in the Reformed High school and we had to divide the 30 or so students into four different teams to take turns going. About 20-25 Roma children wait eagerly for us to arrive. Students take turns leading the Bible story followed by a couple of questions as to what the story teaches us. The children are eager to recite the Bible memory verse and to answer the questions. To see our students from the high school bending near to these little ones, intently speaking or listening to the Roma children is really beautiful to see, and a sweet reminder of what it can mean to be the hands and feet of Jesus. We hope that the time spent together can help to bridge the gap between the different cultures and societies. We hope the Roma children will hear the Word of God through this program, but we also hope that the Hungarian students who come with us will see the Roma children, who, though often dirty and shouting, are children of God made in His image. We hope and pray that God will lead these students who go with us into lives of loving their neighbors and that they will see the Roma with new eyes, and a mission field, if you will, right in their own neighborhood. Please visit the photo gallery for more photos.